The nano particles organise themselves to form a coating and bond with the surface after application. When the surface is smooth and not absorbent, nano particles combine with the surface, so liquids are repelled taking contaminants with them. With porous surfaces, the nano particles fill up the pores from the inside. Fungus, lichen, algae and moss (in and outside) can no longer adhere to the surface. Dirt and liquids can't get into the surface anymore and are simply repelled. This is similar with textiles (natural and synthetic fibres), the fibres are surrounded with the coating. Dampness and dirt can no longer get through the fibres and is simply repelled. The treated textiles are completely harmless to skin. After about one day (with smooth surfaces and fibres) or up to two days (with porous surfaces) the coating develops its full anti adhesive characteristics. 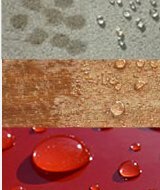 The surface tension decreases through the coating, so that liquids and contaminants can no longer adhere and are simply repelled. The look, texture and breathability of the treated materials are not affected. About one hour after the treatment, the coating can be stepped on with clean soft shoes or objects can be transported and stored. The advantage of a nano coating is, that after drying it is able to accept forces, both chemically and mechanically. It is heat resistant up to 450 degrees Celsius as well as UV stable and frost resistant. A positive side effect is that surfaces become stronger and scratch resistant, so that average mechanical wear does almost no harm to the surface. Also, the elements can no longer do any harm. Sealed surfaces can even be cleaned with a high-pressure cleaner (maximum 50/60 bar or 725/870 psi). Dependent on the surface it can also be cleaned with a brush. A nano coating can last up to one year. When the coating is completely dry, it is harmless to food. With appropriate appliance and drying of the nano coating, damage to the health is not possible. 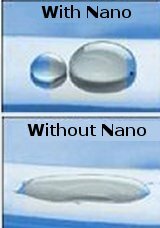 Nano coatings are only a few nanometres thin and cannot be seen with the naked eye. It can only be seen under high magnification. The coating develops a strong chemical connection with the surface. On porous materials, detaching of the coating is not possible without damaging the surface. Smooth materials would have to be treated with a lot of effort, time and drastic methods (such as scouring agents, steel wool etc) to remove the coating. That also applies to 'soft' surfaces (e.g. synthetics), which could be damaged that way, and textiles that are cleaned unnaturally or through wear and tear. 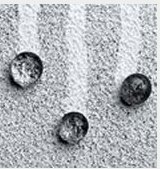 Nanotechnology products have been tested for years, developed steadily and are optimised for surfaces and their material characteristics (for example, for glass, ceramics, stone, concrete, plaster/finery, masonry, natural stones, textiles etc).